Oklahoma Modern: Your Modern Bathroom. Complete. One of the coolest things about a Sixties house is all the nifty built-in stuff. Our favorite built-in features is a revolving toothbrush holder. That chrome door in the bathroom looks like a secret panel when closed. But rotate the magic metal marvel and a veritable oral hygiene command center is revealed! These convenient accessories were popular in the Fifties and Sixties. A company called Hall-Mack offered an entire collection of bathroom built-ins to make your modern life easier. Our house also has a couple of their classic Tow'lescope retractable towel bars (which look like a horizontal radio antenna when extended over the sink). The most rare of all though is the fold-down bathroom scales! 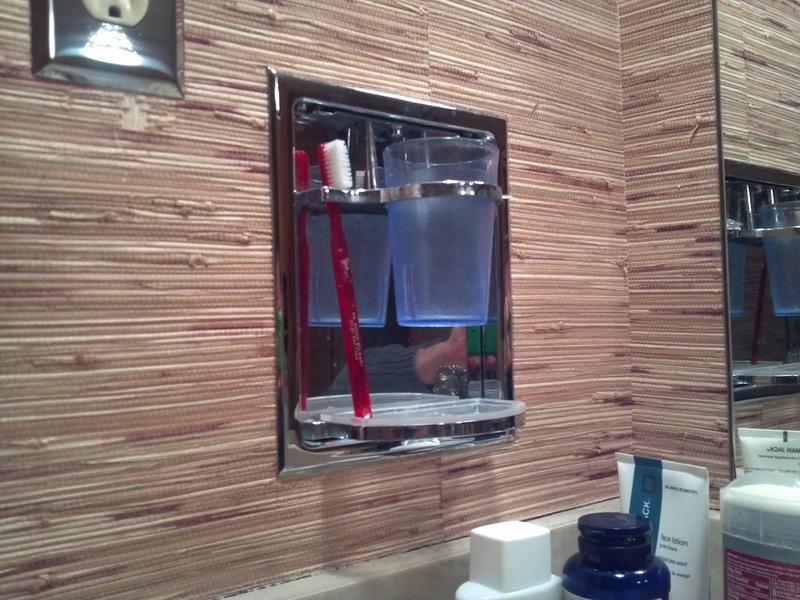 The fancy toothbrush holder is very cool. Very cool indeed. Yet a modern toothbrush will not fit in the damn thing! This prompted a quest for a retro toothbrush- preferably one that was actually was up to everyday use. Lo and behold the answer was (nearly) in our own back yard. Turns out POH (Personal Oral Hygiene) is based right here in Tulsa and still makes very nice toothbrushes of the short and straight variety. They offer them, along with a variety of flosses, from their online boutique. So now you can complete the package and enjoy retro-modern bathroom bliss! This is indeed very cool. We are on the planning stage of our bathroom renovation and I will make sure to suggest this to our designer. Since you pointed out this minor detail, I'll request for it to be customized. Also, it needs to match the bathroom vanities that we selected. Before these bathroom vanities were invented, I remember that we used to have a mirror cabinet which also serves as oral hygiene storage.